(d) It integrates all its planes, dimensions and poises so that the whole phenomenon of consciousness becomes meaningful to serve an evolutionary purpose. (a) Consciousness is not synonymous with ‘mind’—mind is just one of the many planes of consciousness. (b) Mind itself is not synonymous with brain. In spatial terms, mind is non-local, but needs the brain for its expression. (b) Mental consciousness is only the human range which no more exhausts all the possible ranges of consciousness than human sight exhausts all the gradations of colour or human hearing all the gradations of sound – for there is much above or below that is to man invisible. So there are ranges of consciousness above and below the human range. Below the mental or cognitive plane of our consciousness is what Sri Aurobindo names the ‘vital’ plane or plane of life-energy. The vital plane itself has many ranges. In human beings the higher ranges of the vital plane hold the repertoire of our emotions (‘cognition’ and ‘emotion’ have never been clumped together in the Indian tradition, they were always distinct planes – a fact that is only being appreciated now in academic psychology). The vital consciousness lapses into the physical consciousness that constitutes ‘matter’. It is only when the plane of matter is impregnated with life-energy that the ‘vitality’ of the ‘Vital’ becomes gradually evident. Matter otherwise is perceived as inert. In matter, the ‘consciousness’ or ‘chit’ aspect of Chit-Shakti (Consciousness-Force) may not be apparent but the ‘energy’ or shakti aspect is implicit as a mechanical force. The physical consciousness lapses into the ‘subconscious’ (this is what Freud called the ‘unconscious’) that contains all the impressions of the past. The subconscious itself sinks into the Inconscience that appears as a ‘denial’ of everything. Sri Aurobindo explains that the Inconscience is phenomenal, not fundamental. It appears as an inconscient because consciousness has veiled itself totally here. When the evolutionary nisus starts working, it initiates the whole process of unfolding of consciousness from the bosom of the inconscience..
(d) Identified with the transcendental poise of the Absolute. The only problem with this conventional approach was that it necessitated an abandonment of both personal and social life for it was a pursuit suitable for the ascetic, the hermit, the Rishi . Instead of surpassing cognition, He initiates an evolution of cognitive consciousness, unfolding a spiritual mind-range. At levels higher than the mind, the individual cognitive apparatus enlarges in several dimensions, seizes ‘truth’ in its naked purity, gets linked with the universal cognition and further up, the globalized individual cognition is integrated into a sweeping evolutionary movement to come into touch with the supreme essence of the Creative Force that builds the worlds. The life Divine is a logbook of this journey from the Mind to the Supermind and subsequent chapters will build up this wonderful adventure in consciousness. Such a crowning movement leads to a transformation of life and not an abandonment of life. (c) an inmost or ‘true’ being. The mental, vital and physical planes have distinctive identities but are intermingled into a skewed combination that revolves around the ego. In different individuals and even in the same individual, at different points in time, the intermingling has different connotations. This is the basis of individual differences. The inner or subliminal being stands behind the outer being. It has an inner mind, an inner vital and an inner physical that are no longer in a confused, intermingled combination as in the surface being but begin to manifest their distinctive characteristics. (a) Connected to the universal consciousness (a portion of which was called by Jung as the collective unconscious). It is through this connection that the universal rhythm of creativity enters the individual;. (b) Connected to the surface being through channels of communication called chakras. These are mostly closed but can be opened through yoga. Ordinarily, only a little of the inner being can escape into our outer life and that ‘little’ is responsible for the best of our creative, aesthetic and constructive endeavors. If the channels of communication can be made fully operative, we can discover that we are no longer separate personalities with limited lives but centres of a vast, universal, cosmic action. The characteristics of the subliminal being were known in a discrete, scattered way. 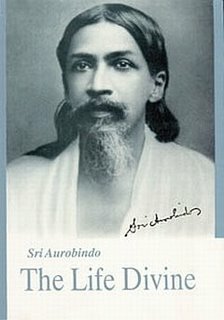 Sri Aurobindo, for the first time in the history of consciousness, has gathered all the past experiences for an unique concept-construct of a well-defined, distinct, highly structured ‘inner being’. This, when grasped by our intellect will be acknowledged as one of the most significant contributions to the world of psychology. The subliminal opens into the Superconscience above and sinks into the inconscience below. The Inmost or True Being is a fourth-dimensional, ego-transcending principle. It is the soul-essence and has its representation at each plane of consciousness. Thus, it is represented by the true mental being (Monomaya Purusha) at the mental plane, the true vital being ( Pranamaya Purusha) at the vital plane, the true physical being ( Annamaya Purusha) at the physical plane and supporting all these, the psychic being ( Chaitya Purusha). In the Sri Aurobindonian perspective, the real individuality emerges when the ego is replaced by the psychic being. When this is attained, one starts living at a deeper level of consciousness and experiences a sense of wholeness, integrality, peace, unity, collaboration and unalloyed joy. The psychic being is supported and upheld by an Eternal Spirit (the Jivatman) which is above the manifestation. Consciousness is simultaneously present in three poises; Individual, Universal, Transcendent. The Universal and the Individual co-exist with the Transcendent, which surpasses both. The Universe is a diffusion of consciousness in infinite Space and Time, the Individual is its concentration within the limits of space and time. This “Self-conscious concentration of the All” is represented in the individual as an Essence or Self (Atman) .This Self, through an extension , can identify with the essence of the cosmic (universal) consciousness or the Cosmic (Universal) Self and likewise with the essence of the Transcendent consciousness or the Transcendent Self. The one Self, expressed in the three poises of the Transcendent, Universal and the Individual is what is called as the Being or Brahman . All the great Yogis of India have described that on gaining the highest kind of mystic realization one makes an immediate experiential contact with the Ultimate Reality as the “Being”. This BEING (Brahman) experienced as the ground of the universe was also identified with the SELF(Atman) –the ground of our psychological existence. Motionless under an inscrutable sky. A hundred levels raised it to the Unknown. Near to his dream of the Invisible.